A few days before my mother's birthday last month, my dad called me and told me that since things had been a little hectic around the house lately, he thought it would be a good idea if we skipped the big fancy birthday dinner out at a restaurant, and instead did something low-key and relaxing. "So," he continued. "I think it would be good if we all just go to your house on Sunday and you can cook." "Oh and I'll pay for the groceries." I accepted, of course, because the only thing I love more than hosting a large group for dinner is hosting a large group for dinner on my dad's dime. Since the party was in three days, I spent the next afternoon assembling a menu and grocery list on Fresh Direct. I decided to start with one of my most popular recipes; stuffed mushrooms filled with a mixture of sausage, dried fruits, nuts, garlic, olives, and herbs. Next came panko-crusted goat cheese medallions baked in the oven and drizzled with vincotto and a salad of mixed greens with 20 year artisan strawberry balsamic that we bought in Sonoma a few weeks ago. I tried to take a few photos of the food that we served, but between the cooking and hosting and arguing with my brother who kept trying to turn the TV on to "the game," I didn't get a chance to document everything as I would have liked. So, with apologies for the blurry photos, I'll post a few of these over the next couple days. The veal can be replaced with chicken in this recipe if desired. 1. Sift the flour into a shallow basin and season generously with salt and pepper. Also sprinkle some of the salt and pepper onto the veal cutlets. Now dip one of the veal cutlets into the flour making sure to coat completely on both sides then set on a baking sheet. Repeat with each cutlet. 2. In a large skillet set over medium-high heat, add the butter and olive oil and heat until the butter is melted and sizzling. 3. Add the veal, in batches if the pan is not large enough, and brown on both sides. Remove from the pan and set on a baking sheet. 4. Into the same pan, add the sliced mushrooms and saute. Add the broth and Marsala and let cook for a minute until it starts to simmer. Lower the heat to medium and then gently arrange the pieces of browned veal back in the pan and let simmer for approximately 5 minutes or until the sauce reduces to two-thirds and thickens slightly. Adjust the sauce for seasoning, adding more salt or pepper if necessary. 5. 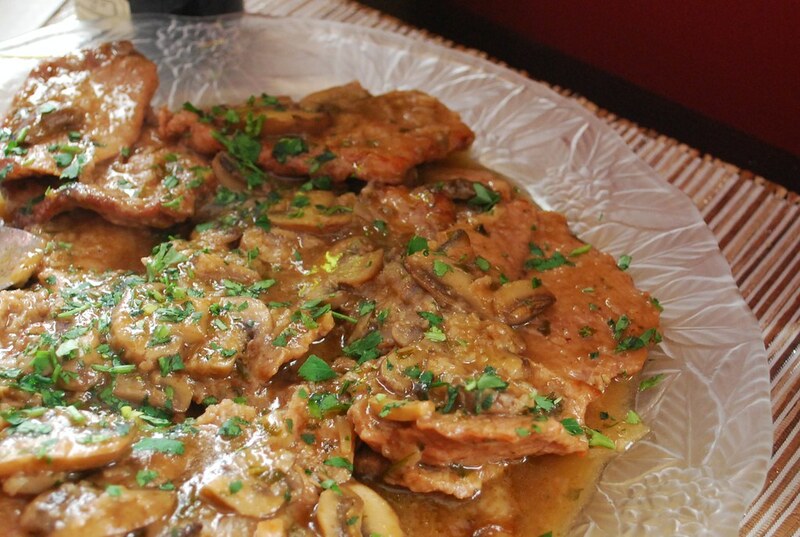 Serve the veal on a large platter topped with the mushrooms and the sauce from the pan. Top with fresh parsley and serve immediately with a side of pasta or sauteed vegetables such as broccoli rabe. Exactly! Meat is SO MUCH better when you don't think about where it's coming from. That is a SERIOUS menu. I like how as you read it just gets better and better.